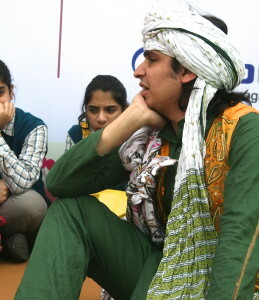 Storytelling, the oldest art form and a valuable tool in education and language development; is here to stimulate your imagination and senses as Kabuliwala has arrived, with his jholla (bag) full of stories. 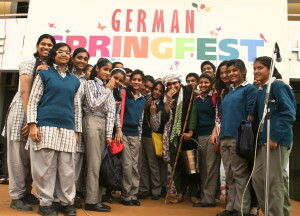 Dressed in quiet impressive attire, he comes on the stage and immediately gets surrounded by the kids of all age. His artistic and dramatized way of story telling definitely leaves everyone impressed, leaving out the notion of age segregation. 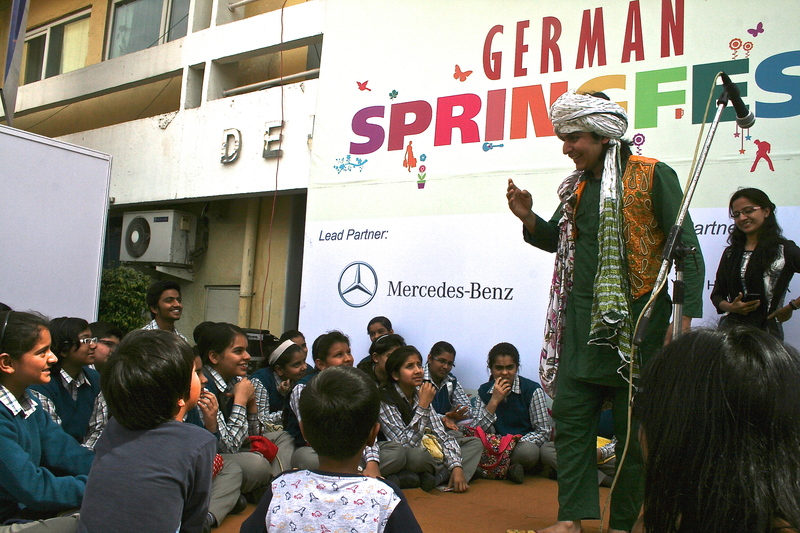 Telling stories at German Spring fest in the German language, Kabuliwala captivate kids with his array of expressions. As the story unfolds, so do his looks. Perfectly styled and embellished story goes on and kids glare at him as he laughs, cries and bleaks. Wide-eyed, ecstatic kids wonder what’s coming next and gets fascinated by his completely dramatized theatrical performance. Kamal Pruthi, now famously known as Kabuliwala is on a mission to revive the culture of story telling in India. Coming with a huge experience of theatre and acting he believes, it is the need of the hour that schools in India adopt the art of story telling. According to him “ CBSE should introduce theater as a subject in school curriculum. Everyone understands the need of story telling but it is seen as a kind of fancy thing not as a core thing. Today, the style of teaching has completely changed than our times but still I try and do workshops for the teachers on how they can integrate stories and stich their subject so that students can use that in their real life, be it Math’s, Chemistry, Biology or Physics”. Language plays a very vital role in our life. It helps us to communicate our feelings, desires, problems and emotions. Learning mother toungue is easy but getting a hold on any foreign language requires lot of hard work and passion. Today, in India there is much craze for learning foreign languages. Be it Spanish, French, German or any other foreign language, storytelling is the most effective and fun technique to teach languages to young children. Telling stories to children leads to higher levels of sophistication in speech and literacy. It is an easy way to make kids engross in rich culture of the language. Storytelling has a great potential for language learning. Kabuliwala, is one artist who loves to perform in four different languages. He performs in Hindi, English, Urdu and German languages. “Students, studying foreign languages have very little access to the language literature and other material whatever they have is all digital. So storytelling plays a very important role in mastering the language being learnt by the student. I make my stories highly descriptive with lots of actions and jokes, like this it becomes interactive with a two way approach” says Kabuliwala. Talking about his love for languages, a very interesting conversation on India’s love for the English language started. Today we all know how India now claims to be the World’s second largest English-speaking country. The Cosmopolitan Cultural Identity reinforced by elite and expensive schools in India has completely taken over our own Matra Bhasha Hindi. English is a new passport to white collar jobs or shall I say Hinglish. Kabuliwala who performs in four languages cited a very thought-provoking incident from one of his shows “ Recently I was in Chandigarh to perform in Punjabi but to my incredulity, everyone wanted me to perform in Hindi and English. English is a slow poison and spoiling the current scenario in India. For me it’s the audience, so during my workshops I give freedom of language to my students”. In the era of Digitization, It becomes difficult to take kids off television and Internet. Thus, Storytelling based on traditional Folktales is a way to take young kids towards constructive personal values by making them experience imaginative situations. This ultimately leads to new and Inventive ideas. Self confidence and motivation is also an outcome of imagination which comes from listening to stories. So is it easy to attract kids for such sessions? “ Kids enjoy my story telling sessions but reaching out to parents to know that something like this is happening is the challenge. Making an artistic product is not enough, getting audiences is also important. Therefore me and my team work really hard on reaching out to schools or parents”. So if till now you were thinking that such sessions are meant only for kids, then you might be wrong! Kabuliwala’s storytelling sessions can help you forget irrationally behaving angry bosses or the work pressure. Initially he did not allow individual adults to his shows, but now whosoever wishes to relive his/her childhood is welcome. 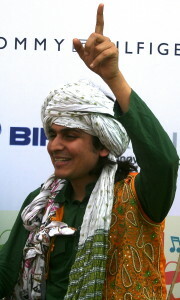 On asking how parents react to his story telling sessions, he said that“ I saw many parents come with a kind of an attitude that they are just accompanying their children and sat behind but within 5 minutes of the story, their stiff bodies started melting and few of them came ahead and sat in front on another occasion”.